You can publish your shop from the Shopfront section in the Online Shop administration. 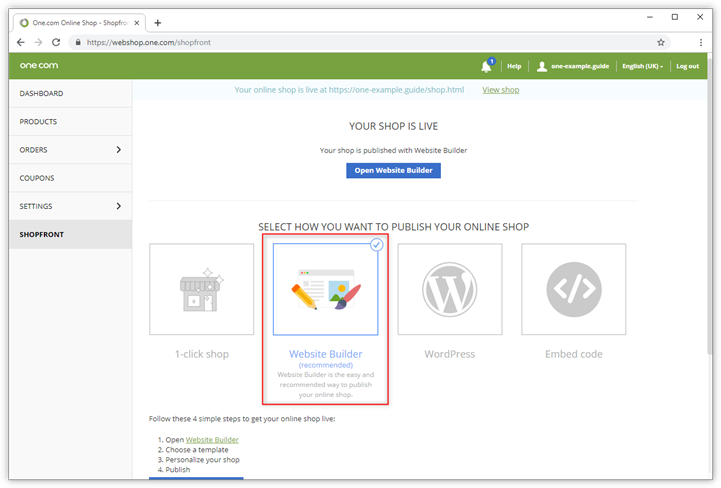 The easiest and quickest way to publish your shop is with the 1-click shop option. It allows you to publish your shop right away on your domain or on a subpage. It's very useful if you quickly want to put your shop online and start selling, before you design your complete site. With the 1-click shop, you cannot change how your shop looks. It will have a default design of a white background and black letters. The recommended way to publish your shop is to insert it in your Website Builder website. Simply drag the Online Shop component in your page, adjust styling and publish. Online Shop and Website Builder are both developed by One.com, therefore we have made sure that the two are 100% compatible. Tip: Did you know, that if you subscribe to the One.com Online Shop, you are automatically upgraded to Website Builder Premium? Learn more about Website Builder Premium. 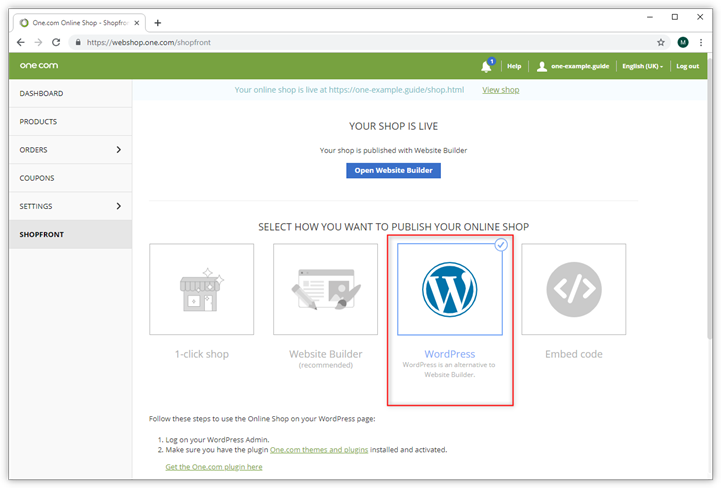 If you have a WordPress site, you can use the One.com Online Shop plugin to publish your online shop. The plugin allows you to insert the One.com Online Shop in your WordPress site with just a few clicks. 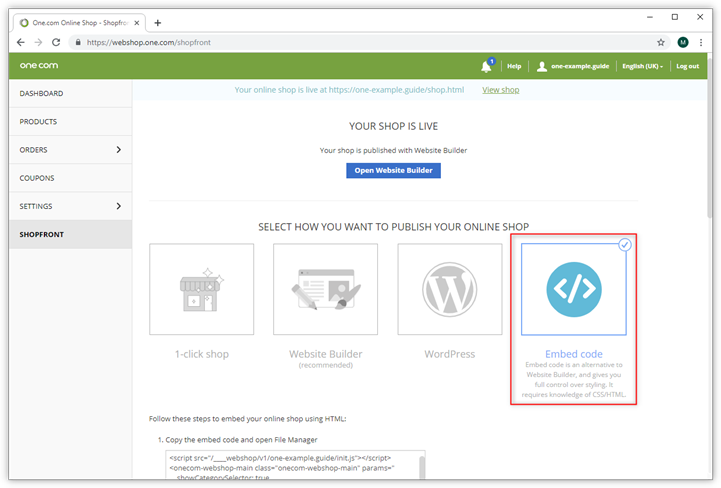 To be able to install the online shop plugin, you first need to install the One.com parent plugin. How do I install the One.com parent plugin? Tip: Did you know that we have converted our most popular Website Builder templates to WordPress themes? Find out how to install a One.com WordPress theme. If you haven't used Website Builder or WordPress to make your site, you can embed the Online Shop in an HTML page. Simply copy the code from the Shopfront section and paste it in the <body> of an HTML page of your website. Tip: The body of an HTML page is between the body tags: <body> "embed code" </body>. Look here for more information: w3schools.com HTML <body> tag. You can adjust the HTML parameters and CSS, to change the settings and look of the shop to your liking. Check out the following guides for more information.